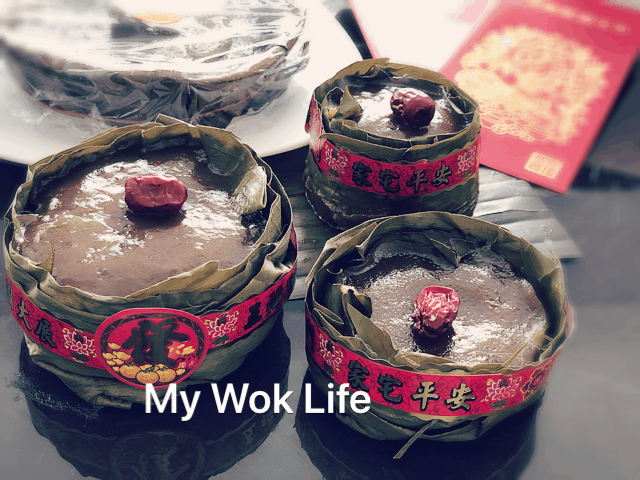 Nian Gao – a traditional festive food to symbolize wealth and status elevation. 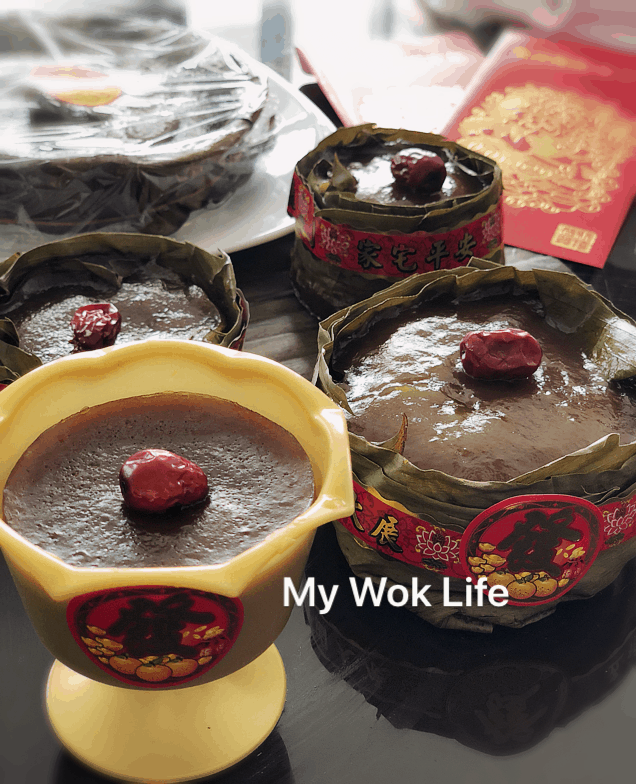 It’s definitely easy to make your own Chinese New Year sweet sticky cake. 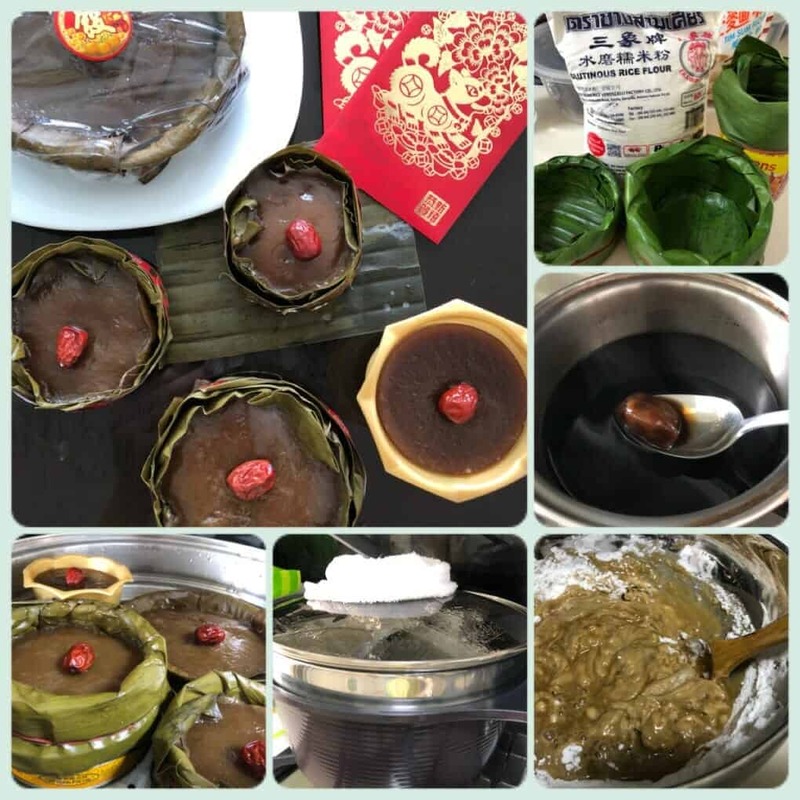 Simple ingredients needed, simple steps to follow, and best thing is, you get to adjust the sweetness and texture of the sticky cake on your own. I did it without hassle, you can, too! Come, follow my easy & tasty recipe. (1) Boil banana leaves till soften. Pat dry, cut and line the banana leaf in the empty can with excess leaf exposed outside the can. Fold and tie the excess lead on the outer. *See video for demo. Line a few layers for each can. Set aside for later. (2) Bring water to a slow boil. Dissolve palm sugar and molasses. Heat off and cool till easy to handle. (3) Mix the flour and starch. Sieve twice. Add warm sugar syrup into flour mixture in batches. Stir gentle to combine. (4) Sieve the brown batter to filter out any lumps. Divide batter among the cans. Cover top with aluminum foil. Transfer over to steamer and steam on high heat for about 30 minutes. Then, reduce heat to medium fire, continue steaming for 1 hour. Check water level half way to avoid steamer from drying up. (5) Test diners by inserting a skewer. It is done when skewer comes out almost clean. Heat off. Remove foil and top a red date on the cake. Cover foil back and let the heat continue the steaming for another 10 minutes before removing from steamer to cool completely. (6) Remove cooled cake from can. Trim away excessive leaf around the edges. 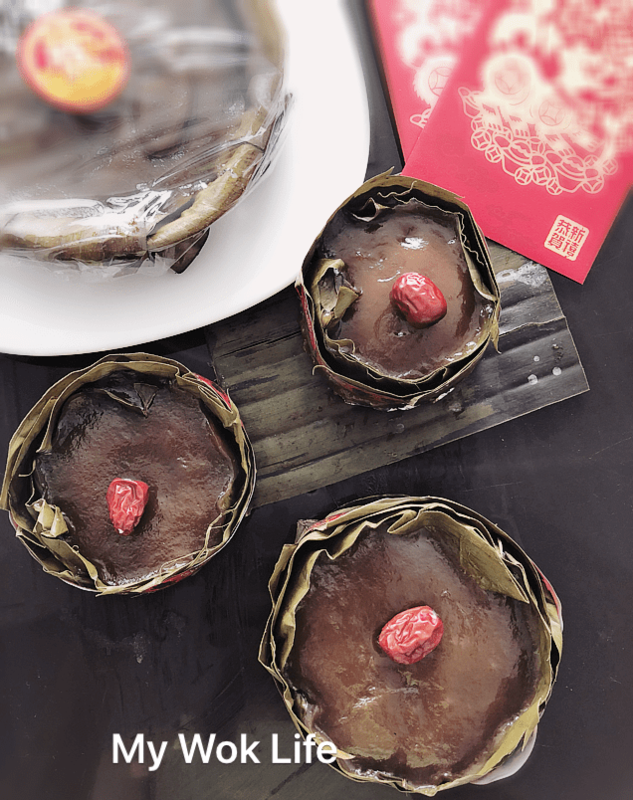 Decorate the Nian Gao, and present it during Chinese New Year celebration for auspicious symbolization. For less chewy texture of the cake, reduce or omit the wheat starch completely. Without wheat starch, the cake will be harden when cooled. However, it will appear molten again once deep fried. However, if you intend to just pan-fry the sweet cake on its own, without other ingredients such as sweet potato and taro slices, I would suggest retaining the wheat starch to hold the shape when pan-frying it. 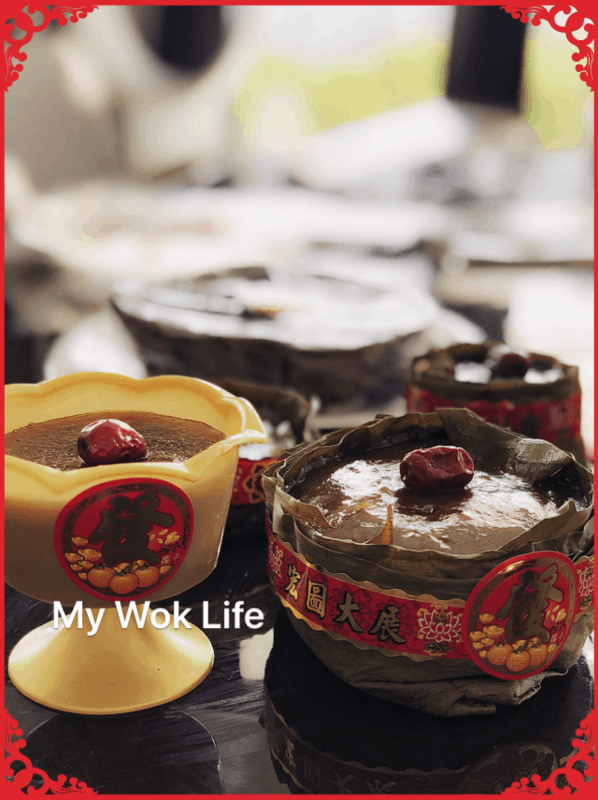 Tips: The making of Nian Gao is completely versatile. You can use any type of sugar, any type of liquid, eg milk or coconut milk, instead of water.